The eponymous region in the state Rheinland-Pfalz also gave the largest growing area Germany his name. It has no geographical reference to the state of Hesse, but the name derives from the existing from 1816 to 1919 historical affiliation of the area as the province of Rheinhessen of the Grand Duchy of Hesse. Rheinhessen is with 26,480 hectares of vineyards, the largest growing area, which is about one-fifth of the Rheinhessen region. Over 6,000 winegrowers produce more than 2.5 million hectoliters of wine per year from around 120 million vines. It is one of the most traditional German wine-growing areas, in the occupied by many finds already before the turn of the century wine was grown. Among other things, an old water pipe in the municipality Ingelheim testifies of the Roman viticulture. In Nierstein is located with the already mentioned in 742 documentary single location Glöck the oldest vineyard in Germany. Emperor Charlemagne (742-814) had a Palatinate there (palace complex) and remarked according to the legend on a Rhine trip the excellent suitability for vineyards. He promoted viticulture here by working in the Rhine valley forests clear and instead planted vineyards. From the year 1546 comes one of the first references to the Riesling, because the German botanist Hieronymus buck (1498-1554) writes of a "Rissling growing on the Moselle / Rhine and in Wormbs" . At that time, Rheinhessen was considered the "wine goblet of Europe". A description about the rhine hessian viticulture without mention of the Liebfraumilch would be incomplete. It became popular from the middle of the 19th century, stood for a long time for excellent quality and was one of the best and most expensive German wines. But then he fell into a cheap, mostly sweet to sweet vinified mass wine which was exported to all world. One of the main varieties is Müller-Thurgau, the most successful German new breed, which had a share of more than one third in Rheinhessen in 1970. That has more than halved since then, but the strain is still at the top. From the beginning of the 1960s, many of these new varieties were cultivated, especially in Rheinhessen, and reached a share of 40% until 1980. However, this development is in favor of the classic grape varieties such as Riesling, Silvaner and Burgundersorten again declining. 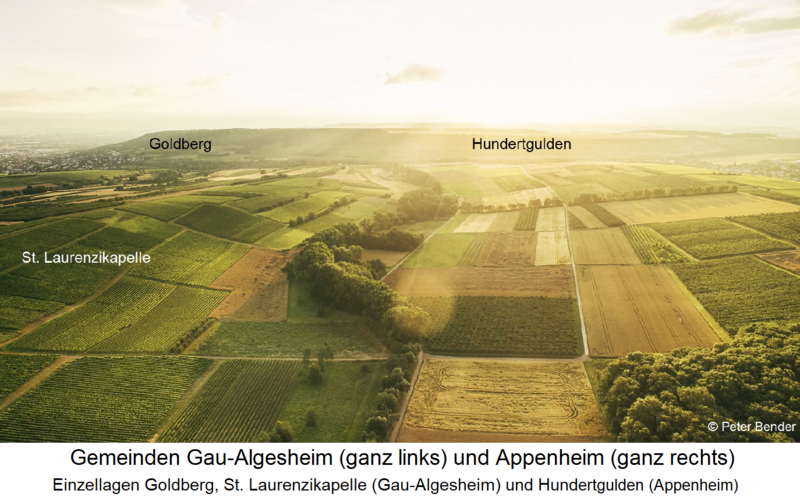 By the way, in Alzey there is a regional institute for grapevine breeding, where the vines cultivator Georg Shy (1879-1949) worked. Rheinhessen is located on the left bank of the large Rhine knee between the towns Bingen. Mainz and Worms in the form of a giant triangle. The Rhine limits the area to the north and east. Due to the hilly nature of the landscape, it is also referred to as the "land of the 1,000 hills". The soils consist mainly of loess, as well as sand, marl, limestone, clay, Rotliegend, brown earth, quartzite and porphyry. The climatic conditions for viticulture are optimal. Under the protection of Odenwald and Taunus there are mild average temperatures between 9.4 (Alzey) to 10.4 ° Celsius (Worms). The low-precipitation area with warm summers and mild winters is one of the warmest German growing areas with 1,600 hours of sunshine per year. Rheinhessen is one of the driest areas in Central Europe. Except in the southwest, the average annual rainfall is only 550 millimeters. However, the loess cover, which is prevalent in wide areas up to 15 meters deep, and the marl and clay soils prevent dry damage due to a good water balance. The vineyards on the banks of the Rhine are often called Rhine front designated. Of the 136 communities, 120 end up as "home" and only four do not cultivate wine in their own district. Rheinhessen is divided into three areas Bingen, Nierstein and Wonnegau with 24 major locations and 434 individual locations.